By Professor Karima Bennoune for the Guardian (www.guardian.co.uk). In many Muslim societies, the 40th day after a death is a time to gather and grieve again with loved ones. So, in honor of this the 40th day after the atrocities in Boston, I find myself thinking again about the 264 injured people, some of whom are learning to live without their legs, and about the dead victims: 23-year-old Chinese graduate student Lingzi Lu, who had just passed her exams, friendly 29-year-old waitress Krystle Campbell, and eight year-old Martin Richard who famously carried a sign that said "No more hurting people. Peace." Bearing such losses in mind, I would ask anyone who wants to support the rights of people of Muslim heritage in the United States in the wake of the Boston bombings, please do not so by explaining that jihadist terrorism is simply a response to US foreign policy, or a consequence of the alleged difficulties faced by Muslim youth in integrating into American culture, or the result of Russian bombing of Chechnya. Many of us have criticisms of US foreign policy and that of other countries; integrating may indeed be challenging for those from immigrant backgrounds in many contexts; and Chechens did suffer through the intolerable flattening of their country by the Russian military between 1992 and 2009. (As far as I know the United States never bombed the province.) However, most Muslims, immigrants and Chechens have not become terrorists as a result. These things are no excuse for – or even explanation of – the choice to deliberately murder children and young people at a sporting event. Such a grave international crime has nothing to do with legitimate grievances and everything to do with extremist ideology and movements that indoctrinate and instrumentalize young people. We must defeat those movements which have killed so many civilians, especially in Muslim majority countries like Afghanistan, Algeria, Iraq and Pakistan. "We cannot defeat terrorism by an anti-terrorist battle without doing the anti-fundamentalist battle." In other words, it is not just the violence of radical jihadis, but the underlying ideology of Islamism that we must confront. That ideology discriminates between Muslims and non-Muslims (as evidenced by Tamerlan Tsarnaev's reported indignation that his Imam mentioned Martin Luther King, a non-Muslim, during a sermon), and between "good" and "bad" Muslims. It justifies egregious violence against women and civilians, or at least creates an environment conducive to them. Of course, being an Islamist or a jihadist is not same thing as being a devout Muslim, and it is unhelpful when the US media simply describes radicalization as becoming "more religious". This process is rather the adoption of a dangerous political stance that deploys religion in the service of an extreme agenda. The best way then to take a pro-human rights stance in the face of recent events is to support those people of Muslim heritage who are risking their lives to denounce and defy these movements. Many have raised their voices around the world in places like Afghanistan, but have rarely been heard in the west. Discrimination against Muslims in the wake of an atrocity like the Boston bombings is wrong and unhelpful, but so too is a politically correct response, which fosters justification and denial. A young Iranian-American scholar reported that at a recent conference at UC Berkeley on Islamophobia, she was bullied by older US academics for daring to raise the issue of Muslim fundamentalism, along with anti-racism, and, in the same week as the Boston bombings, was told that there was no such thing as what she called "the Muslim right". We must face the reality of extremism. "[o]nce again we share unspeakable horror at the carnage … Once again we express our condemnation and outrage. Once again we wonder how many more times we will do this before there is resolve to deal with religious militancy." I think of the Libyans who took to the streets of Benghazi in 2012 after the murder of US ambassador Chris Stevens. Or of Somali American activist Abdirizak Bihi who campaigned against Al Shabaab recruitment in the Somali-American community in Minneapolis, after his own teenage nephew's recuitment and death at the hands of the militants. We have to support these people and listen to their voices. In light of the national origin of the alleged Boston bombers, I have been thinking a lot about a wonderful Chechen journalist I interviewed in Moscow in December 2010. A devout Muslim, Said Bitsoev, then-deputy editor of Novye Izvestia – an independent newspaper – was terribly concerned about what such movements were doing to his home province. "There [a]re a lot of radical people who are really bad for Chechnya. They want to put the country back in the dark ages." Before the Chechen wars, most followed a spiritual Sufi Islam, in contrast to the harsh dogma of the extremists. Said himself loathed the radicals, their new restrictions on women, and new forms of violence. He especially hated the thousands of foreign jihadis who came to Chechnya during the second war. "They brought a lot of fear. I was not able to sleep without a gun under my pillow." These foreign fighters left behind a new breed of Chechen "radical-thinking Islamists" in Bitsoev's view. "The worst thing," Said tells me, is that they were "hunting for those Muslims who were representatives of tolerant Islam, and killed these people". He gives the example of Umar Idrissov, 80, a mufti from Urus-Martan, southwest of Grozny, who was assassinated in 2000 by the Wahhabi group "Wolves of Islam". In fact, across the Caucasus liberal Muslim clergy have been regularly targeted in recent years by extremists. Said Bitsoev was all too aware that Chechens like those murdered clerics, or like him, are relatively inconspicuous internationally. "Radicals are interesting for the public because they are loud. We normal people are boring," he said. We must support the daily struggles of people like Said, who are too often invisible, against those who twist the religion of their birth into a totalitarian terror manifesto. In today's column, I analyze a significant administrative law case handed down by the U.S. Supreme Court earlier this week, City of Arlington, Texas v. Federal Communications Commission (FCC). Arlington v. FCC is an extremely interesting decision in that it has many of the trappings of an important Supreme Court ruling-a divided (5-1-3) Court, a dissent (by the Chief Justice) proclaiming a "fundamental" disagreement with the majority, a majority opinion expressing concern that the dissenters want to radically rewrite an area of law-and yet close inspection is required to get a meaningful sense of the space between the different positions staked out by the Justices in the case. State and local governments, including the City of Arlington, Texas, challenged this FCC rule on the ground that the FCC did not have authority to interpret the term "reasonable period of time." Instead, contended the challengers, ambiguity in this term could be interpreted and resolved by courts only. The United States Court of Appeals for the Fifth Circuit rejected the challenge, holding that Congress did not clearly resolve what "reasonable period of time" meant, and that in light of this textual uncertainty, the FCC's interpretation of that term was entitled to deference under the famous 1984 administrative law case of Chevron v. Natural Resources Defense Council, which holds that certain agency interpretations of statutes are to be upheld so long as they are reasonable and permissible readings, even if they are not the interpretations that courts would embrace in the first instance. In other words, under Chevron, certain, minimally plausible, agency interpretations of ambiguous statutes carry the day, even if courts, confronted with the questions anew, would find those interpretations to be less convincing than other interpretations. Arlington took the case to the Supreme Court and argued that Chevron deference to agency interpretations makes sense in many settings, but not, as here, where the agency has interpreted a provision "that concerns the scope of the agency's statutory authority (that is, its jurisdiction.)" More specifically, the challengers of the FCC ruling contended that Chevron deference is not appropriate as to "jurisdictional" questions concerning "the who, what, where and when of regulatory power." Rather, deferring to agency interpretations of statutes is warranted under Chevron only when the agency's power to regulate in a particular area has already been determined, and the question is how the regulation will be undertaken. On Monday, the Supreme Court spoke, and the majority in Arlington emphatically and repeatedly rejected this proffered distinction, between an agency's "jurisdiction" to regulate (as to which Arlington said no deference should be accorded the agency's reading of the statute), and the agency's decisions about how to regulate (as to which interpretive deference would still apply.) Justice Scalia's majority opinion (joined by Justices Thomas, Ginsburg, Sotomayor and Kagan) said this distinction is based on a "misconception" and a "premise [that is] false," and labeled the distinction "an empty distraction," "mental acrobatics," and a "mirage." According to Justice Scalia, "[n]o matter how it is framed, the question a court faces when confronted with an agency's interpretation of a statute it administers is always, simply, whether the agency has stayed within the bounds of its statutory authority." There is no difference between questions of how the agency regulates, and questions of when, where and as to whom the agency regulates. Instead, wrote Justice Scalia, as long as an agency is given by Congress the general power to administer a statute through the promulgation of rules and the resolution of disputes, and as long as the meaning of the statutory provision in question has not been definitively resolved by Congress, the agency is entitled to deference as to how to interpret and apply the provision. Indeed, Justice Scalia argued, to embrace the distinction the challengers advocated would be to pull the Court one large step down the path of dismantling the Chevron deference idea altogether. And since the majority had no desire to take such a step, it upheld the Fifth Circuit's decision to afford the FCC's interpretation of the term "reasonable period of time" substantial deference. Justice Breyer agreed with some of what Justice Scalia said, and he concurred in the majority's bottom line-that the Fifth Circuit should show deference to the FCC in this case-but Justice Breyer wrote separately to emphasize that he thought more factors should be considered before deference is appropriate. Justice Breyer found relevant not just the FCC's general power to administer the Act and the ambiguous nature of the term "reasonable period of time" (the two factors most prominent in Justice Scalia's analysis), but also that the decision of how much time it should reasonably take to process an application to build or modify a wireless tower involves detailed knowledge of the industry, such that the FCC's expertise in this field would assist in giving intelligent meaning to the statutory language. And he found nothing in the larger statutory framework that suggested any countervailing reason to be distrustful of FCC interpretive power here. Chief Justice Roberts, joined by Justices Kennedy and Alito, dissented. Although they did not identify particular reason to be wary of FCC interpretive power in this setting in particular, they expressed deep concern about giving agencies too much interpretive power generally. Indeed, the most interesting and important aspect of the dissent (and perhaps the entire case) was the dissatisfaction the dissenters expressed with the modern administrative state. They described how, today, administrative agencies "as a practical matter . . . exercise legislative power, . . . executive power . . . and judicial power. . ." , and that the "accumulation of these powers in the same hands is not an occasional or isolated exception to the constitutional plan[, but rather] a central feature of modern American government." Echoing some of the rhetoric used by a majority of Justices to reject the Commerce Clause as a basis for Congress's enactment of the Affordable Care Act, the dissenters registered their belief that "the Framers could hardly have envisioned today's vast and varied federal bureaucracy and the authority administrative agencies now hold over our economic, social and political activities." The dissenting Justices also lamented how difficult, for practical and other reasons, it is for the President to keep watch over an ever-growing and increasingly active army of federal bureaucrats-"with hundreds of federal agencies poking into every nook and cranny of daily life." And they worried about the breadth of agency discretion that Congress creates when it passes laws directing the executive branch to regulate "in the public interest" or for such other, equally grandiose but equally undefined, purposes. In this brave (my term, not theirs) new world, the dissent observed, a citizen "confronting thousands of pages of administrative regulations" might "perhaps be excused for thinking that it is the agency really doing the legislating." In light of Congress's delegation of basic, essentially legislative, policy decisions to the executive branch, and given the President's inability or disinclination to meaningfully oversee all of the alphabet soup of federal agencies, the dissenters were fearful of construing Chevron deference too broadly, because doing so would reduce the power of the courts to rein in agencies. The dissenters agreed with the majority that when a statutory provision is ambiguous, and when Congress has given the agency the power to interpret that statutory provision in particular, courts should defer to agency interpretations; the dissenters thus purported not to want to cut back on the core of Chevron deference. But the dissenters would insist that, before deference is given, there be a demonstration not simply that Congress gave the agency the general power to administer the statute as a whole, but rather that Congress gave the agency the power to interpret the specific provision at issue. Usually (maybe almost always), Congress's conferral of general power to administer a statute would support a finding that Congress intended to confer power to the agency to interpret the relevant substantive or procedural provision at issue, but the dissenters apparently can envision situations in which an agency is given general power to administer a statute, but not the power to interpret at least some of the statute's particular provisions. The dissenters didn't know that to be the case for the FCC and the statutory provision at issue in this dispute, but they would remand to the Fifth Circuit to at least ask and answer the question of whether Congress intended the FCC to be able to interpret the "reasonable period of time" provision in particular, before deference to the agency's understanding of that term is afforded. How Deep Is the Disagreement Between the Majority and Dissent? So the different approaches taken by the majority and the dissent in Arlington may not end up mattering in many real or hypothesized cases. But there does seem to be a meaningful difference concerning the extent to which the majority and the dissent are comfortable with the Chevron regime at a more basic level. For the majority, as dangerous as giving agencies broad interpretive power under Chevron may be, it is better than giving judges leeway to pick and choose when to defer to agencies and when not to. Judges are even less politically accountable than are agencies, and more prone to generating disuniform interpretations of statutes based on ad hoc judgments. According to the majority: "The excessive agency power that the dissent fears would [absent a strong Chevron deference doctrine] be replaced by chaos." Maybe there is something to commend this categorical preference for agencies over courts-and make no mistake, that is what Chevron deference is. In this regard, it is worth noting that the majority in this case that favors broad agency interpretive power is comprised of both "liberal" and "conservative" Justices; when Justices of different ideologies agree on a contentious issue, there is often something good to be said about the arguments they find persuasive. But courts do have one advantage over agencies; if a court misinterprets the meaning of a congressional statute, Congress can in theory amend the statute more easily than it can if an administrative agency misinterprets the statute (under a regime where a court is bound to defer to that misinterpretation.) Any attempt by Congress to rein in an overly aggressive agency interpretation might be met with a threat of a Presidential veto. The fact that the executive branch wears many hats (involved in lawmaking, law applying and law interpreting) complicates efforts by Congress to keep it in bounds. In this respect, the instinct of the dissenters that broad delegations of power to the executive branch are particularly scary (and maybe more so than even broad delegations of powers to the judiciary) is an important one to consider and keep watch on in the future. This is especially true in light of, as the dissenters put it, "the dramatic shift in power over the last 50 years from Congress to the Executive." Cross-posted from Law and Politics Book Review. The book is Governing Immigration Through Crime: A Reader. Authors: Julie A. Dowling is Assistant Professor of Latina/Latino Studies at the University of Illinois, Urbana-Champaign. Jonathan Xavier Inda is Associate Professor of Latina/Latino Studies at the University of Illinois, Urbana-Champaign. For several years, immigration scholars have criticized the increasing reliance on the criminal law (and criminal penalties) to enforce the U.S. immigration laws, which historically have been enforced through civil sanctions. Juliet Stumpf encapsulated the growing body of scholarly criticism in her seminal work “The Crimmigration Crisis,” a path-breaking article reprinted in Governing Immigration Through Crime. The criminalization of U.S. immigration law has proceeded relatively quickly through a variety of steps. Congress in the last 25 years has systematically reformed the immigration laws so that increasing numbers of crimes can result in the removal of lawful permanent residents from the country. Exhibiting an Alice in Wonderland-like quality, the immigration laws today frequently classify misdemeanors as “aggravated felonies,” thus subjecting a lawful permanent resident to near-mandatory removal from the United States. The harshness of the removal grounds has led a conservative Supreme Court on several occasions to intervene; for example, the Court in 2013 halted the virtually mandatory removal of a long term resident of the United States guilty of possession of a few grams of marijuana for personal use (Moncrieffe v. Holder). Congress also has required the mandatory detention of the ever-expanding category of “criminal aliens,” which has created a huge, and growing, immigrant detention industry (McLeod 2012). Beginning in earnest during the George W. Bush administration, U.S. immigration authorities have worked increasingly closely with state and local law enforcement authorities to remove noncitizens from the United States. The Obama administration has enlisted state and local police in efforts to enforce the U.S. immigration laws. Many states have passed immigration enforcement laws relying on the criminal law ostensibly designed to encourage undocumented immigrants to “self deport.” In addition to extension of an expensive fence along the U.S./Mexico border, U.S. immigration authorities have dramatically increased enforcement operations to levels never previously seen before in U.S. history. Last but not least, the crime of “illegal re-entry” into the United States has been prosecuted ever-aggressively by the U.S. government, contributing to docket congestion in the federal courts and a large increase in the number of Mexican nationals imprisoned in the United States. The increased use of the criminal law to regulate immigration has had dramatic impacts. In President Obama’s first five [*209] years in office, his administration set records by removing roughly 400,000 immigrants from the United States annually; he has by a large margin deported more noncitizens than any President in U.S. history. It is noteworthy that removals have not been limited to undocumented immigrants but include many lawful permanent residents who have lived in the country for many years. Hundreds of thousands of removals have resulted in the destruction of hundreds of thousands of families, communities, and lives. Although the administration claims to focus on serious criminal offenders, many of those caught in the enforcement net are at best small time criminals, including persons arrested for traffic infractions such as lacking driver’s licenses for which undocumented immigrants are not eligible in most states. 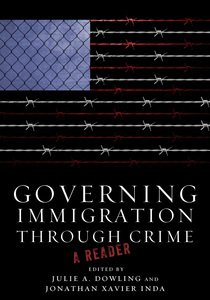 Governing Immigration Through Crime collects in one reader important contributions to the scholarly literature on the use of the criminal law in immigration enforcement. The previously-published works were written by influential scholars from law and the social sciences, including anthropology, sociology, ethnic studies, criminology, urban planning, communication, and political science. The stated aim of this book “is to provide an interdisciplinary introduction to the governing of immigration through crime” (p.38). Fulfilling that aim, the editors’ selection and organization of the book results in a concise and thoughtful reader, with the pieces offering important perspectives from a variety of vantage points. The volume begins with an extended introduction to “Governing Migrant Illegality” that sets the stage for the subsequent readings. The editors “broadly (but not exhaustively) map the governing of immigration through crime in the contemporary United States” (p.3, footnote omitted). As the editors state, “in the contemporary United States, undocumented immigration has come to be seen largely as a law and order issue” (p.5, footnote omitted). Much of the public and many political leaders characterize undocumented immigrants as social, economic, political, and national security threats to the nation. In response, the U.S. government has adopted an array of criminal measures to deter undocumented immigration, such as criminalization of immigration violations, increased enforcement (at the border and beyond), immigration raids, additional technology, detention and deportation, and more. Importantly, because of the disparate impacts of immigration enforcement on [*210] Latinos, Governing Immigration Through Crime conceptualizes “immigration enforcement as a form of racial governance” (p.18). These impacts can be seen most clearly at the U.S./Mexico border, with deaths of Mexican migrants resulting from border enforcement operations on a regular, predictable basis. Similarly, enforcement measures in the interior of the United States have had disparate impacts on Latinos, who represent approximately 75-80 percent of the persons annually deported from the United States. Governing Immigration Through Crime recognizes that Latinos and immigrants have contested racialized immigration enforcement. In 2006, tens of thousands of people marched in the streets of cities across the United States in protest of – and ultimately defeated – a tough-as-nails immigration bill passed by the House of Representatives. Since them, undocumented college students known popularly as the DREAMers have pressed the nation for justice, eventually pushing the Obama administration to establish the Deferred Action for Childhood Arrivals program. The book is divided into five parts. Each part of the book has a short description of the chapters in that section. Part I, “Law and Criminalization”, outlines in general terms the criminalization of U.S. immigration law. It includes chapters offering insights on Mexican migration to the United States (Nicholas DeGenova), the emergence of the “crimmigration crisis” (Juliet Stumpf), and the national security focus on migration since September 11, 2001 (Jennifer Chacón). Part II, “Managing Borders”, has chapters on the physical and symbolic meanings of the growing U.S./Mexico “border wall” (Josiah McC. Heyman), the Minuteman Project’s vilification of Mexican migrants (Leo Chavez), and border-crossing deaths (Roxanne Lynn Doty). This part nicely links various enforcement measures, such as the border fence and the growing death toll of migrants in the U.S./Mexico border region. Part III, “Policing the Interior”, includes chapters on the rise and fall of employer sanctions under U.S. immigration law (David Bacon and Bill Ong Hing), the human and civil rights impacts of Arizona’s immigration enforcement landmark S.B. 1070 (Rogelio Sáenz, Cecelia Menjívar, and San Juanita Edilia Garcia), and local immigration enforcement (including analysis of the passage of Hazleton, Pennsylvania’s much-publicized anti-immigrant ordinance) (Liette Gilbert). Added to the immigration laws in 1986, employer sanctions, which allow for the imposition of civil penalties on the employers of undocumented workers, has to this point failed to deter the employment of undocumented immigrants, thus contributing to political movements favoring state and local immigration enforcement measures. Part IV, “Detention and Deportation”, includes chapters on the detention of Latinos as part and parcel of immigration enforcement (David Manuel Hernández), deportation and return to the United States of transnational Mexicans (Deborah A. Boehm), and the deportation of immigrants who had made the United States their true homes, aptly termed [*211] “exiled by law” by Susan Bibler Coutin. Part V, “Immigrant Contestations”, includes chapters analyzing the mass immigration protests, or “La Gran Marcha”, of 2006 (Josue David Cisneros), the undocumented student movement (Robert G. Gonzales), and the use of surveillance strategies by groups seeking to ensure the protection of human rights and security (James P. Walsh). The various chapters touch on the central issues raised by regulating immigration through deployment of the criminal laws. All of the chapters directly or indirectly criticize the use of the criminal law to regulate immigration to the United States. Their shared conclusion is that Governing Immigration Through Crime is a bad idea. Supporters of the current use of the criminal law to regulate immigration – and even its possible expansion – are not the intended audience of Governing Immigration Through Crime. Space limitations necessarily require omissions in coverage. However, a few omissions deserve comment. The reader might have benefited from analysis of the most significant criminal immigration program currently in existence – the Obama administration’s Secure Communities program, which has culminated in more deportations than ever in U.S. history. Secure Communities requires state and local law enforcement to share information about persons arrested with U.S. immigration authorities. The program has generated considerable criticism from state and local law enforcement as well as immigrant rights’ advocates. It arguably undermines local law enforcement efforts to obtain the support of the immigrant community in ordinary law enforcement. In addition, the chapter on Arizona’s S.B. 1070 would have benefitted – perhaps in a postscript, another chapter, or otherwise – from further analysis of the U.S. Supreme Court’s decision in Arizona v. United States (2012). Although striking down three core provisions of S.B. 1070, the Court left intact the law’s most controversial provision, Section 2(B), which requires state and local police to assist in the enforcement of the U.S. immigration enforcement laws. Activists have voiced serious concerns that Section 2(B)’s implementation will result in increased racial profiling of Latinos – U.S. citizens, legal immigrants, and others – in law enforcement. More generally, one might have thought that a volume on the use of the criminal law in immigration enforcement would have considered the day-to-day immigration enforcement, namely the widespread practice of racial profiling of Latinos. The Supreme Court in 1975 held that “Mexican appearance” could be one of many factors in an immigration stop, a holding that has resulted in the legal sanction of racial profiling in immigration enforcement (United States v. Brignoni-Ponce). Such profiling helps account for the disproportionate stops and arrests of Latinos for immigration (and other law enforcement) violations as well as disparate detention and removal rates (Johnson 2010). Last but not least, one is left to wonder what impact comprehensive immigration reform might have on the general [*212] phenomenon of governing immigration through crime. Immigration reform has been percolating in Congress for well over a decade. Unfortunately, current proposals on the table would increase, not decrease, the criminal law’s regulation of immigration with, for example, efforts to exclude and remove alleged “gang members.” At the same time, employers could be required to use a computerized database known as E-Verify to check the employment eligibility of all employees, which could make employer sanctions more enforceable and diminish the need for criminal measures. In conclusion, Governing Immigration Through Crime offers important readings from influential legal and social science scholars critically analyzing the efforts of the United States to regulate immigration through the criminal laws. Although a few recent developments are not covered in the reader, the chapters aptly outline and succinctly criticize the increasing criminalization of immigration law in the United States. Allowing noncitizens who are legal immigrants to serve on juries is a desirable reform in a society devoted to judgment by one's peers and juries that represent a cross-section of the community. Assembly Bill 1401, passed overwhelmingly by the California Assembly, would do just this, permitting legal immigrants, as well as U.S. citizens, to serve on juries. The Assembly Committee on the Judiciary highlighted the laudable goals behind the expansion of eligibility for jury service: "jury service is understood to be a democratizing force and a societal obligation." Importantly, AB 1401 would extend jury service eligibility only to "lawful permanent residents," a legal term of art referring to immigrants lawfully admitted to the United States who under the U.S. immigration laws generally possess the right to remain indefinitely, if not permanently, in the United States. The bill would not allow temporary visitors or undocumented immigrants to serve on juries. Nothing in the state or federal constitutions prohibits noncitizen service on juries, or, for that matter, being lawyers or even judges. Nor, despite the cries of opponents, are noncitizen jurors unprecedented. Indeed, there was a long tradition in England, from where the United States imported its right to trial by jury, of allowing noncitizens to serve on juries. For close to 700 years, the English justice system permitted the jury de medietate linguae ("jury of the half tongue"), also known as mixed juries. To ensure fair treatment of a minority by the majority, noncitizen litigants had the right to request that half of the jury consist of noncitizens. English colonists brought the mixed jury to America. Trial by mixed juries for a time was the practice in the colonies and, after the revolution, the United States. The legally enshrined ideal, and constitutional requirement, is for American juries to be pulled from a cross-section of the community. Immigrants unquestionably are part of communities throughout California. Some counties, including but not limited to Los Angeles (18.6 percent), Orange (15.3 percent), and San Francisco (14.7 percent), have large immigrant populations. These residents pay taxes and live and work in the community and serve in the military; many have children who are United States citizens. Immigrants are subject to the laws just like U.S. citizens, but play no role in resolving legal disputes. Similar to the revolutionary battle cry of "no taxation without representation," unrepresentative juries render judgments that are less legitimate than more representative juries in the eyes of minorities. History teaches that the "all-white jury" convicting an African American defendant is presumptively illegitimate. Historically, minorities and women were barred from jury service, which today is condemned and discriminatory and wrong. One can only wonder whether some of the opposition to the expansion of jury eligibility is due to racial anxieties and anti-immigrant sentiments that too long have been part of this country's fabric. Nor does AB 1401 eliminate any of the other eligibility requirements for jury service, requirements that help ensure that jurors embrace community values. English language proficiency, for example, remains a requirement to serve on a jury. It alone is likely to result in immigrant jurors who are the most assimilated of all immigrants into American culture and values. In addition, all jurors must be domiciled in California and residents of the county in which they would serve, again contributing to the likelihood that they represent the values of the community. Moreover, a felony conviction disqualifies any person - immigrant and U.S. citizen alike - from jury service. Opponents of AB 1401 assert that U.S. citizenship is somehow the equivalent of knowledge of the American legal system or of embracing American values. There is no basis for this assumption. In fact, passing a test about civics or the law or the Constitution is not required of any citizen as a prerequisite for jury service. Some citizens have basic knowledge in these areas, while some don't. Undoubtedly the same will be true of noncitizens serving as jurors. Noncitizens work in this country, abide by its laws, and have by their actions shown appreciation of the freedom and liberty that is uniquely American. There is no reason to assume that they are less knowledgeable about or less committed to the system than United States citizens. There is no doubt whatsoever that it is constitutional for the state to have noncitizens serve on juries. It is highly desirable because expanding juror eligibility to lawful permanent residents would make juries look more like the communities for which they serve - and more legitimate to immigrant communities and more true to American democratic ideals. Co-authored with Dean Erwin Chemerinsky of UC Irvine School of Law. This op-ed is reprinted from The Sacramento Bee. In my column today, I analyze an interesting case that a state Supreme Court will soon decide that illustrates, and has implications for, important national questions concerning the Establishment and Free Exercise clauses of the First Amendment. In particular, the Kentucky case, Kant v. Lexington Theological Seminary, demonstrates the need for the U.S. Supreme Court to answer many of the key questions it left open in last year's blockbuster ruling in Hosanna-Tabor Evangelical Lutheran Church and School v. EEOC, where the Court recognized a so-called "ministerial exception" enjoyed by religious institutions in employment discrimination suits. I begin by providing background on the 2012 Hosanna-Tabor ruling, and then explain how the Kentucky courts thus far have understood and extended that ruling in the Kant dispute. The plaintiff in the Hosanna-Tabor case, Cheryl Perich, was a commissioned minister in the Lutheran Church-Missouri Synod who worked as a faculty member at a small church-operated K-8 parochial school in Michigan, where she taught, at various times, among other things, math, language arts, social science, gym, art and music. She also taught a religion class four days a week; led students in daily devotional exercises and prayers; and led a school-wide chapel service a few times a year. She later developed narcolepsy and informed her employer about her condition and, ultimately, her intention to assert her legal rights under the disability laws. She was ultimately fired, and brought a charge with the federal Equal Employment Opportunity Commission (EEOC) against Hosanna-Tabor, claiming that she had been terminated in violation of the Americans with Disabilities Act (ADA). The EEOC then filed suit against Hosanna-Tabor, alleging that it had unlawfully fired Ms. Perich in retaliation for her assertion of her ADA rights. The U.S. Supreme Court ruled in favor of the school, holding that the Establishment and Free Exercise Clauses of the First Amendment bar employment discrimination suits brought on behalf of ministers against their (employer) churches, and that Ms. Perich fit the definition of "minister" for these purposes. The Court began with a brief history of the Constitution's religion clauses that highlighted the need for government not to interfere with important internal church processes. It then discussed cases in which the Court had, under the Constitution, deferred to church tribunals that were established within a church's hierarchy to resolve disputes over the proper use of church property or assets when disagreements between various individuals or factions within the church arose. The resolution of these "quintessentially religious controversies," the Court reminded, is "strictly a matter of ecclesiastical government" that is committed to "the highest ecclesiastical tribunals" and not something for the courts to undertake. Relying on these principles and on the experience of lower courts in this realm, the Justices unanimously (albeit in three separate opinions) concluded that the First Amendment compels a "ministerial exception" to employment antidiscrimination laws that precludes the application of these laws to claims concerning the employment relationship between religious institutions and their ministers. The Kentucky case now pending was filed by Laurence Kant, who was formerly employed as a tenured faculty member at the Lexington Theological Seminary (LTS). LTS is affiliated with the Disciples of Christ Christian denomination. The dominant (but perhaps not sole) purpose of LTS, reiterated at the beginning of its Faculty Handbook, "is to prepare faithful leaders for the church of Jesus Christ and, thus, to strengthen the church's participation in God's mission for the world." All of the Seminary's degree programs are faith-based, and are designed to prepare graduates for Christian ministry. Mr. Kant is not a Christian minister; he is not even a Christian. He is of the Jewish faith and during all relevant times he maintained his Jewish religious beliefs. While at LTS, he taught a range of courses focusing on, among other areas, biblical studies, Jewish studies, Jewish-Christian studies, world religions, biblical languages, and religion and culture. In 2006, he was awarded tenure. The LTS Faculty Handbook (mentioned above) described tenure in the following terms: "Tenure . . . means appointment to serve until retirement, resignation or dismissal for adequate cause. . . [T]he only grounds for dismissal or a tenured faculty member are moral delinquency, unambiguous failure to perform the responsibilities outlined in this Handbook, or conduct detrimental to the Seminary. . . Along with tenure, however, go the responsibilities specified in the Handbook as well as an added expectation of leadership in the faculty." In 2009, after the nation's financial crisis hit LTS's endowment hard, LTS declared a financial emergency and announced its intention to take dramatic steps, including the elimination of the tenure of its faculty along with other cost-cutting measures, designed to keep the institution solvent. Pursuant to this plan, LTS terminated Kant's employment in 2009. In both respects, the Kentucky court's ruling goes significantly beyond the Supreme Court's ruling in Hosanna-Tabor, and highlights the need for the Supreme Court to provide additional guidance in this area. Let us first consider the Kentucky court's decision that it could not weigh in on Kant's contract claims because to do so would impermissibly draw it into resolving ecclesiastical matters. The majority opinion says "Kant's claims . . . cannot be decided without interpreting the Faculty Handbook to determine whether it allows for restructuring of LTS under a financial emergency and for eliminating tenured faculty under those circumstances. Indeed, an inquiry into the rationale for LTS's decision making as to who will teach its students-all of whom attend there with a desire to become pastors or ministers-would be an inquiry into an ecclesiastical matter by this Court." This seems like a non sequitur to me. The first sentence is undeniably correct; Kant's breach of contract claims require interpreting the promises-and the limits on those promises-made in the Faculty Handbook; the handbook is the contract on which Mr. Kant relies. But the second sentence would not seem to follow; deciding whether the Faculty Handbook contract implicitly contains a right of LTS to eliminate tenure in times of financial emergency does not involve religious doctrinal or ecclesiastical matters in any way. If LTS had fired Kant because it said that he had engaged in religiously immoral behavior within the meaning of the Faculty Handbook, deciding whether certain deeds were morally delinquent (within the context of the church community) might draw courts into ecclesiastical matters. But deciding whether a contract has an exception for financial emergency does not. To see this, imagine that Kant had taught physical education, rather than religious studies. And imagine that the Faculty Handbook promised that tenured members of the faculty would be entitled to use the Seminary's gymnasium after school hours for free. If the Seminary later tried to begin charging tenured faculty for use of the gym (because of financial exigencies), would anyone argue that a breach of contract claim relying on the Handbook would implicate ecclesiastical matters? Or imagine a contract that was entered into not with an LTS employee, but rather with an outside provider of services. Let us suppose LTS hires a roofer to put on a new roof. The contract states: "In order to promote the use of the LTS facility as a continuing Seminary, Roofer X shall put on a roof suitable for educational structures for which LTS will pay him $Y." Now imagine further that the roofer puts on a new roof, and LTS, because it is at that time in some financial difficulty, refuses to pay the roofer (so that it will have money to buy new books for its library instead). If the roofer then sues on the contract, we could not say that interpreting the contract and inquiring into whether the reason LTS has not paid-the desire to spend the money on other religious-instruction-related programs-is permitted under the contract as an excuse for non-payment draws a court into ecclesiastical matters, even though such a contract claim would involve an inquiry into "the rationale for LTS' decisionmaking" as to how to devote its resources. Certainly the ecclesiastical-matters barrier to adjudication cannot mean that religious institutions can never be sued for breach of contract, and just because the contract with Kant involves faculty personnel does not mean that interpreting it involves ecclesiastical matters. To the extent that the Supreme Court's invocation of ecclesiastical deference in Hosanna-Tabor and other cases has been misunderstood, clarification by the high Court will be helpful. This point leads us nicely into the ministerial exception topic, because it may well be that what troubled the Kentucky Court of Appeals most was not the ecclesiastical nature of the contract, but rather the ministerial nature of the party suing-Kant. And there are aspects of this case that make it a more attractive candidate for application of the ministerial exception than was Hosanna-Tabor. In particular, the fact that Kant taught at a wholly sectarian Seminary-as contrasted with the parochial school in Hosanna-Tabor, a place designed not for religious ordination but rather for a general, if religiously-based, education-leans in LTS's favor. Yet there are a number of other differences between the two cases that cut against the application of the ministerial exception in Kant. First, Hosanna-Tabor involved an exception to anti-discrimination laws. The Court there explicitly "express[ed] no view on whether the exception bars other types of suits, including . . . breach of contract" [claims]. There will be enough time to address the applicability of the exception to other circumstances if and when they arise." The Kant court acknowledged this caveat in Hosanna-Tabor, but nonetheless-and without any analysis or explanation other than the mention of the fact that some lower federal courts had applied the ministerial exception to contract claims-simply extends the exception. Maybe it makes sense to apply the ministerial exception outside of the context of anti-discrimination laws, but certainly some discussion of why this is so-and how far the exception should reach-is in order. Second, and very important, the Kant court found that Mr. Kant fell within the ministerial exception because of the religious-instruction function that he performed within LTS-"teaching students who desired to become involved in Christian ministry." As the court noted, "[b]ecause Kant's primary duties involved teaching religious-themed courses at a seminary," he is covered by the exception. This seems far too quick. For starters, as the dissent points out, there is a difference between teaching religion (when one is trying to convince students to accept certain religious beliefs, or at least reinforce those beliefs), and teaching about religion, which is an academic exercise in ideas, not an attempt to inculcate particular spiritual beliefs. And on the record in this case, Mr. Kant may very well have been doing the latter. More generally, and perhaps more fundamentally, there is a divergence between the Kant court's approach and that of the Supreme Court majority in Hosanna-Tabor on the question of how we decide whether someone is a minister for these purposes. In Hosanna-Tabor, the Court eschewed any rigid formula, but it did stress not just the function of a particular employee, but also the status and title that that employee enjoyed and used. Indeed, in Hosanna-Tabor, the Court identified four reasons why Ms. Perich should be considered a minister: (1) the "formal title" of minister was given to her by the church when she was commissioned; (2) as a prerequisite to that commission, she undertook religious training and education designed to demonstrate her faith and her ability to minister; (3) she used the title herself and held herself out as a minister and a believer; and (4) she undertook certain "functions . . . performed for the Church." Three of the four factors (the first three) focus on title and status, rather than function. Indeed, the Court in Hosanna-Tabor chided the United States Court of Appeals for the Sixth Circuit (the lower court in the case) for failing "to see any relevance in the fact that Perich was a commissioned minister." As the Court observed, "the fact that an employee has been ordained or commissioned as a minister is surely relevant, as is the fact that significant religious training and a recognized religious mission underlie the description of an employee's position." And yet the Kant court all but ignored the fact that Mr. Kant is not-and could not be, since he is openly Jewish-considered a minister within the Disciples of Christ church. He professed no belief in, and was not commissioned under, any Christian faith. Neither he, nor the church, would consider him a minister for any purpose other than a legal immunity from suit. It is true that Justice Alito (joined by Justice Kagan) wrote separately in Hosanna-Tabor to make clear their views that function-and not just titles or status-should matter in deciding who is a minister. But they seemed to be writing particularly about religions that don't use commissions or ordinations or titles of ministers; thus, their opinion needn't be read to say that, for religions that do use such titles, the status of a particular employee should not be an important factor. Moreover, the fact that Justices Alito and Kagan felt they had to write separately serves to underscore how important status/title was in the analysis of the majority opinion, which six Justices signed onto without elaboration or reservation. In any event, whether one feels the Kant ruling is an overly expansive application of the ministerial exception or not, the larger point is that before too long, the Supreme Court is going to need to step back in and clarify precisely how broadly, and to whom, the exception applies. The Supreme Court has had a steady diet of immigration cases in recent years, with Padilla v. Kentucky (2010) and Arizona v. United States being the most well known of modern vintage. In the 2011 Term, the Supreme Court issued five immigration decisions. Three of the cases involved removals based on criminal convictions, which have been before the Court in increasing numbers in recent years. The recurrence of criminal removal cases should not be surprising given that the Obama administration has been removing noncitizens who have had brushes with the law in record numbers. The immigration docket slowed a bit in the 2012 Term, with only two immigration decisions handed down by the High Court. However, the Court did decline to again enter the fray of state immigration enforcement laws. In 2012, the Court decided Arizona v. United States, the blockbuster ruling that curbed state laws purportedly seeking to enforce the U.S. immigration laws. This spring, the Court, with Justice Scalia in dissent, denied certiorari in Alabama v. United States, the Alabama immigration enforcement law case. The state of Alabama had sought cert after having lost in no small part in the Eleventh Circuit. Adrian Moncrieffe immigrated to the United States from Jamaica at age 3 and grew up in the United States. He is the father of two U.S. citizen children. Moncrieffe was pulled over while driving in his home state of Georgia. Police found 1.3 grams of marijuana in his car, an amount the Supreme Court stated as enough for two to three marijuana cigarettes. Moncrieffe was charged with violating an expansive Georgia statute that criminalizes behavior ranging from the social sharing of a small amount of marijuana, to distribution of large quantities of marijuana for sale. Moncrieffe pled guilty and successfully completed probation. Two years later, immigration officials arrested and detained him, and initiated removal proceedings against Moncrieffe alleging that his conviction was an “aggravated felony” and a therefore a “felony” under the federal Controlled Substances Act. The immigration court ordered Moncrieffe removed from the United States. The Board of Immigration Appeals affirmed and the Fifth Circuit denied the petition for review. In a 7-2 decision, the Supreme Court in Moncrieffe v. Holder resolved a split among the circuits concerning whether a conviction under a state statute that simultaneously criminalizes conduct characterized by both of the Controlled Substance Act (CSA)’s felony and misdemeanor provisions constitutes a felony conviction under the CSA, thus making the crime an “aggravated felony” for immigration purposes (and thus making the noncitizen ineligible for a variety of forms of relief from removal). The Court held that a conviction under state law criminalizing social sharing of a small amount of marijuana is not an “aggravated felony” because the Georgia statute encompassed intent to distribute without regard to amount and remuneration. Moncrieffe v. Holder is the third time in seven years that the Court held that a relatively minor drug offense was not an “aggravated felony” for immigration purposes. The Court has been unwilling to impose what amounts to mandatory removal on long term lawful permanent residents of the United States based on relatively small time drug crimes. The decision in Moncrieffe v. Holder thus will aid small time drug offenders in future removal cases. For detailed recaps of the opinions on Moncrieffe, click here and here. Roselva Chaidez entered the United States from Mexico in 1971 and became a lawful permanent resident in 1977. In connection with an automobile insurance fraud scam in which she received less than two thousand dollars, Chaidez on advice of her attorney pled guilty to two counts of mail fraud and was sentenced to probation and restitution. Her conviction became final in 2004. According to Chaidez, her attorney never warned her that her conviction could result in her mandatory removal from the country. In 2009, after Chaidez’s naturalization petition brought her and her conviction to the attention of the federal government, removal proceedings were instituted against her. Through a writ of coram nobis, Chaidez sought to set aside her conviction. While the petition was pending, the Court issued its decision in Padilla v. Kentucky (2010), which held that the Sixth Amendment requires defense attorneys in criminal cases to inform noncitizen clients of the deportation risks of guilty pleas. The Seventh Circuit held in Chaidez’s case that Padilla does not apply to a challenge to a conviction that became final before it was decided. In Chaidez v. Holder, the Supreme Court agreed with the Seventh Circuit. Justice Kagan wrote for seven justices and ruled that Padilla v. Kentucky does not apply retroactively to cases already final on direct review. Justice Sotomayor, joined by Justice Ginsburg, dissented. The majority ruled that the change in the law was sufficiently significant that it should not apply retroactively. There is little reason to think that Chaidez will have much of an impact on the Court’s retroactivity or immigration jurisprudence. The Court understood this to be a run-of-the mill application of basic retroactivity principles, with the junior Justice assigned the decision. Moreover, although tangentially involving immigration law, the decision does not meaningfully address any issues of immigration law or change in any way the holding in Padilla v. Kentucky. At the same time, the Supreme Court’s holding that Padilla v. Kentucky will not apply retroactively will no doubt affect large numbers of plea deals in which the convictions were entered into before March 2010. The Obama administration has made it a priority to remove “criminal aliens” from the United States and has based many removal actions on convictions more than a few years old. Ultimately, thousands, if not, tens of thousands, of lawful permanent residents facing removal are likely to be affected by Chaidez and likely to suffer significant hardships if removed from the United States. Chaidez, for example, has lived in the United States for four decades and has three children and two grandchildren who are U.S. citizens. Now facing removal, she faces the possibility of being stripped from the only community and family she really has ever known. For a detailed recap of the opinions in Chaidez, click here. The Supreme Court’s immigration decisions in the 2012 Term (as well the last two Terms) are difficult to characterize except to say that the Court approaches each case on an individualized basis and applies conventionall rules of administrative agency deference, statutory construction, retroactivity analysis, and the like. The analysis is not ideologically-heavy handed and the outcomes can be difficult to predict. Immigrants seem to win more than they lose, a pattern that one might not necessarily predict in a Supreme Court led by a conservative Chief Justice.